Seven people were ticketed for transporting firewood more than 50 miles without certification of heat treatment at three checkpoints held by New York State Department of Environmental Conservation (DEC) Environmental Conservation Police in the Adirondacks on Friday, August 17. Two checkpoints were located near Lake George; one on the northbound off ramp of Exit 21 of the Northway (I-87) and the other nearby on Route 9N under the Northway overpass. Approximately 7,000 vehicles were screened through these checkpoints to determine if they were transporting firewood. Thirty-one vehicles with firewood were inspected resulting in six people receiving tickets for violations of firewood transportation regulation. Violations included transporting wood from out of state, transporting wood from a quarantined and transporting from untreated firewood from more than 50 miles from its source. In addition to being ticketed, the six people were provided information and educational material about the firewood transportation regulation and the dangers of spreading invasive insects. Their firewood was confiscated and bagged. It was later taken to the DEC Office in Warrensburg where it was chipped to destroy any potential invasive insects. Six of the cars inspected were carrying firewood that had been heat treated in compliance with the regulation. Eight people were transporting firewood within 50 miles of the source but without a completed source certificate document as required by the regulation. They were issued warnings and provided assistance in completing the source certificate. DEC staff also provided information and educational material about the firewood transportation regulation and the dangers of spreading invasive insects. Many campers that passed through the checkpoints explained that they were aware of the regulation and chose to comply with the regulations by obtaining wood locally. Several trucks with logs passed through the checkpoint. These were inspected by staff from the U.S. Department of Agriculture’s Animal and Plant Health Inspection Service and DEC’s Division of Lands and Forests inspected the trucks and found no violations. The drivers were provided information and education materials regarding the laws pertaining to the transport of logs. The third checkpoint was located in the southern Adirondacks, on State Route 30 near the boundary line of Hamilton and Fulton counties. Only one ticket for illegally transporting firewood from out of state and seven warnings were issued to people who were transporting firewood within 50 miles of the source but without a completed source certificate document. Again the illegally transported firewood was confiscated, bagged and transported to the DEC office in Northville for chipping. Source certifications were completed on site with DEC assistance. Educational information and material was provided to all firewood transporters. 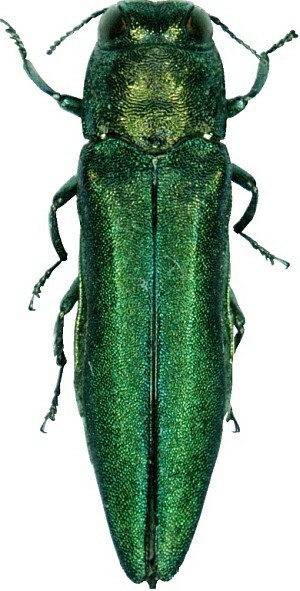 EAB has been found in the Hudson Valley, the Catskills and Western New York. It is responsible for the destruction of more than 50 million ash trees in the United States since its discovery in Michigan in 2002. The main method of movement of EAB across the country has been through the transport of firewood to campgrounds. By transporting firewood, campers and homeowners could spread diseases and invasive insects that can quickly kill large numbers of trees. Don’t Move Firewood – You Could be Killing Our Trees! It is best to leave all firewood at home – please do not bring it to campgrounds or parks. For firewood not purchased (i.e. cut from your own property) you must have a Self-Issued Certificate of Source and it must be sourced within 50 miles of your destination.